The three volumes of Marx’s Capital run well over two thousand pages. We know we have at least one life on earth, and we do not know if we pass to any other state of being we might recognize as a common world. Millions of workers have been active in labor unions and in class struggles without reading a single page by Marx. So what is the good of tackling Marx’s Capital? Is our time (always running out) well spent with this book? Yes, and I recommend the Penguin edition, with a translation by Ben Fowkes of the first volume, and a translation by David Fernbach of volumes two and three. If we entrusted the history of class struggles only to fragmentary human memory, we would have many wonderful stories. The telling of stories needs no defense, but any comprehensive history of human labor under both capitalist and socialist regimes would have to be both a labor of love and a work of scholarship. At this stage of history, that would also require a degree of collective labor. Marx lived and died before the world wars and social revolutions of the twentieth century, so his survey of labor and capital may seem even further removed from our concerns in the twenty-first century. Nevertheless, Marx’s Capital is a foundational work in both economics and in the critique of class rule. 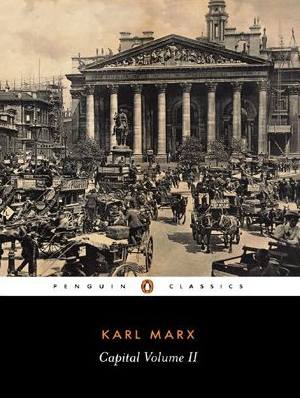 Indeed, Marx chose this subtitle for his work: “A Critique of Political Economy.” The division of labor is foundational in the creation of any complex human community, and every class divided society also establishes the ruling ideas of ruling classes. In some respects, the work of Marx resembles an ideological steam engine. For example, in his Hegelian habits of mind. That is not to my taste, but the grounding of “dialectical” thought in material production and class struggles was a useful point of departure. No one else ventured so far on that path, and no one else in his time had his set of surveyor’s tools. When Marx wrote of the working day, he was both a poet and a prophet. If economics has a reputation as the “dismal science,” Marx also makes us reconsider the material conditions of knowledge. We have not yet exhausted the lessons he may teach us, even if the furnaces and factories of the nineteenth century seem like distant scenery. Marx was not an occultist and could not foresee the stream of events we recall every time we wake up or listen to the daily news. To judge him by that measure only shows how backward and obscurantist his critics can be. In powers of observation and analysis, Marx still has more to teach us than all the op-ed columnists who pretend to patronize him. There are, to be sure, new things under the sun. A recent mutation in the rule of capital is the sheer volatility and mobility of financial instruments in the past twenty years. That includes the shell-game of derivatives, and all the more arcane tinker-toys of finance. The most up to date forms of class rule are grounded in precedents, of course, but the rate of change is stunning, and coincided with drastic and deepening class divisions in the United States. The banking crisis in this country had a rapid rebound effect in Europe, and the current class struggles against austerity regimes in Europe are also worrying bankers and corporate boards round the world. We are witnessing the slow collision of imperial spheres of interest, and we cannot know if we will also endure a new era of world wars. It’s worth noting that it was a Democratic president, Bill Clinton, who signed away the Glass – Steagall Act, even as he signed away the last remnants of real protection for single mothers and dependent children under the old New Deal. The fact that such a view appeared in U.S. News indicates the fractures opening even in official ideology. Bill Clinton claims that scrapping Glass-Steagall actually gave the country a softer landing after the worst perils of the banking crisis. Clinton is an advocate of the Social Darwinism he learned in the Ivy League, and he can triangulate all of his public policy decisions in just that manner. The Clintonistas always take the view from the managerial heights, and what counts with them is that big banks still had some moves left on the chessboard of global capital, long after millions of ordinary people had been bumped out of the game as pawns. In the Los Angeles chapter of the Socialist Party, the plain question has been raised: Why socialism? Many answers may come to mind, but the recent history of the Democratic Party suggests a strong reason to choose democratic socialism: Because the “progressive” career Democrats cannot be trusted with basic democracy, and they proved to be such effective managers of state sponsored social regression. We need to fight the corporate parties fair and square with an independent and class-conscious program. A fair fight is a better way to live. Years ago, a conservative journalist found out I had given a talk at the New York Marxist School, and he tagged me as “that Marxist.” Well, it’s not that simple, or not in my own mind. Why not ask why some Ivy League graduates are willing to read Aristotle but not Marx? As though Marx is “demonic.” The philosopher and psychologist Karl Jaspers used that very word to describe Marx in one of his letters to Hannah Arendt. Her view of Marx was more worldly and pointed. She was reading Marx again in the course of writing The Origins of Totalitarianism, and when she wrote to Jaspers in return, she said that Marx had not paid enough attention to political liberty. Arendt did not think a republic could ever be well founded unless the pluralism of the public sphere was also given forethought and preserved with courage. (We do not need to idolize Founding Fathers in order to value the First Amendment, and indeed Arendt had more sympathy with the American revolutionaries of the eighteenth century than with their French counterparts.) In Arendt’s fine essay on Rosa Luxemburg (included in Men In Dark Times), Arendt praised Luxemburg precisely as a revolutionary republican. Arendt was among the few scholars to note that “the republican question” brought Luxemburg into conflict with both Lenin and Kautsky, in short, with both revolutionaries and reformists. If we read Luxemburg carefully, we will also find that she claimed the authority of Marx and Engels in demanding a class-conscious struggle for a republic. Luxemburg was quite right to do so, and in my own essay on her life and work I quote “chapter and verse” from Friedrich Engels: “If anything is certain, it is this: that our party and the working class can only come to power under the form of a democratic republic. This is even the specific form for the dictatorship of the proletariat, as the great French Revolution has already shown.” (See “Rosa Luxemburg and the Libertarian Left”: http://www.truthdig.com/report/page3/rosa_luxemburg_and_the_libertarian_left_20110114/ ). To the first statement I consent, and I dissent from the second statement. The “specific form” of dictatorship in the French Revolution passed from Robespierre to bourgeois rule, and later to the enlightened imperialism of Napoleon. (Enlightened, that is to say, if compared to the other contending forms of European empire. Beethoven famously dedicated his Third Symphony to Napoleon, and then blotted out the dedication when Napoleon declared himself Emperor.) The “specific form” of proletarian dictatorship during the French Revolution was no more than a small conspiracy, and the conspirators (notably Babeuf) were promptly guillotined when the plot was discovered. Marx was both more precise and polemical than Engels in such matters, and for these reasons we can still enjoy The Eighteenth Brumaire of Louis Bonaparte, which is both a well-spun story and a satire on later Napoleonic delusions of grandeur. Democratic socialists regard socialism as an extension of democracy into the realm of the economy, which is certainly part of the unfinished business of the Enlightenment. But we don’t think the culture of socialism is compatible with any form of dictatorship. Even Luxemburg tried to preserve the very phrase “the dictatorship of the proletariat” as though it was an essential doctrine in a creed, but she did so by pointing to the specific form of a republic founded upon councils of workers. What I reject root and branch is the notion that “Leninism” — whatever one thinks of Lenin— is the scientific laboratory of Marxism in the realm of practical action. On the contrary, the ground of common struggle is the practical fight for greater democracy, and not just in the realm of the economy nor only on election days. Much better to have political pluralism than a Central Committee that claims to carry out the judgment of history. In that sense, the practice of democracy must make a clean break with the practice of placing state power in the service of any clique of technocrats, however enlightened they claim to be. Marx’s Capital was not a positive blueprint for socialism. On the contrary, it was a study of the conditions under which capital is extracted from our common world and from human brains and muscles. In this sense, the whole work demonstrated the power of negative thinking. Even (or especially) when Marx underscores the world-transforming power of capital. The “simple” substance of the first volume of Capital is summarized in Marx’s own words: “The simple elements of the labour process are (1) purposeful activity, that is work itself, (2) the object on which that work is performed, and (3) the instruments of that work.” Of course, the reader does not find this “simple” statement until well over 200 pages have passed. Marx, however, begins Capital with “the analysis of the commodity,” namely, of any useful thing made to satisfy human needs. “The nature of these needs,” writes Marx, “whether they arise, for example, from the stomach, or the imagination, makes no difference.” Marx knows very well that such differences do, in fact, make a difference depending on conditions of bare survival or conditions of luxury. But such distinctions already tend in the direction of the analysis of class divisions. Instead, he presents the reader with a stark premise: the thing-like “nature” of a useful product, a thing valued for use. From the very start, Marx has laid the foundation for his critique of the alienation of labor, and the reduction of human brains and bodies to wage labor and the needs of capital. This premise is a stepping-stone given by Marx so the reader can cross the later streams of his larger argument with some security underfoot. The style of Marx is usually quite clear, and often vivid. Only in the last volume is the texture denser. I was never a math prodigy, so I had trouble in my youth cracking his more algebraic propositions. But they are not really “higher math.” He gives you the key to each symbol (as does Luxemburg in The Accumulation of Capital), so those passages just take more patience. That’s pretty standard in any economic text. Besides, my first exposure to this book was a streamlined edition that stripped away the more complex formulas, and stuck to the bedrock arguments. A book of this kind is a building, and readers will find many doors and floors over the years. Marx is best read in open collision with other thinkers. Many of the so-called “libertarians” today are reading von Hayek or (at a much baser level) Ayn Rand. But they can’t be bothered to read Marx with what used to be called “disinterested intelligence.” In my view, Marx had a much more grounded understanding of the price workers pay for the “free market” than von Hayek, and anything von Hayek has to say on liberty was already better said by Mill. The bloody stain of twentieth century totalitarianism was on von Hayek’s mind, and his chiming theme is that the “free market” is the only secure republic of liberty. When reading von Hayek’s book The Road to Serfdom, it is worth noting what he does and does not say about the function of national borders in a global market. No more than Marx, von Hayek could not imagine the hypermobility of capital over all borders, to such a degree that Western nation states may once again become tools of outright barbarism. Is such barbarism incompatible with some degree of liberty? Not if we recall that an imperial power can remain a guarantor of constitutional liberties for sectors of the public. Today, even those sectors are served notice that liberty is given as a kind of credit card to citizens in good standing, and possibly only to people who “have nothing to hide” under a creeping regime of state surveillance. The forms of war (through long distance drone strikes, for example) and of domestic counterinsurgency (through the national police crackdown on the Occupy movement, for example) show real signs of change in state power. The “Great Game” of imperial spheres of interest, likewise, continues through the use of mercenary forces (a form of wage labor) and proxy wars. John Maynard Keynes is also crucial reading for any democratic socialist, because of his practical influence on any number of social democratic governments, including the administration of Franklin Roosevelt. The New Deal was a Keynesian managerial response to a historic tide of open class struggles, including some strikes that advanced rapidly to workplace occupations. The economist Paul Krugman, who writes regular op-ed columns for The New York Times, never tires of proposing a Keynesian program to Obama and his inner circle of economic advisers. If Obama were interested, he would have hired Krugman. Instead, Obama is testing what kind of austerity regime will be tolerated by the working majority of this country without open class revolt. When we defend the rights of workers, we don’t expect everyone to be coming home from jobs and union meetings to read hundreds of pages of Marx. But in every generation since the Industrial Revolution, some workers made great sacrifices to join study circles and read books in earnest. Some of them even paid that price with their lives. Their stories also belong within the dialectic of enlightenment. Marx helps us to consider how capital is extracted from the earth and human labor, and in this sense his book Capital is a long preface to the ongoing global story of how workers forge bonds within and across national borders. Marx and Engels proudly distinguished between “scientific socialism,” namely, their own brand, and all other kinds of utopian socialism. What remains of such a “science” today can only be our decision to pay attention to reality. As for utopia, Oscar Wilde wrote in The Soul of Man Under Socialism, “A map of the world that does not include Utopia is not worth even glancing at, for it leaves out the one country at which Humanity is always landing. And when Humanity lands there, it looks out, and, seeing a better country, sets sail. Progress is the realization of utopias.” For workers of all countries, “the dignity of labor” now includes an open class struggle against austerity regimes. Democratic socialists dare to hope that the day will come when even the ruling class learns to earn an honest living. This is very good. People should read this. I didn’t see any other comments so I just thought I’d say that for starters.